The long-rumored Cingular 8525 has finally gotten an official announcement. Built by HTC (codename Hermes) and branded for Cingular, the 8525 is an update to the popular Cingular 8125. 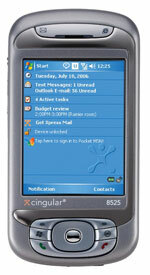 Cingular will begin shipping the 8525 on November 16th. With a contract pricing is expected to be $399.99.